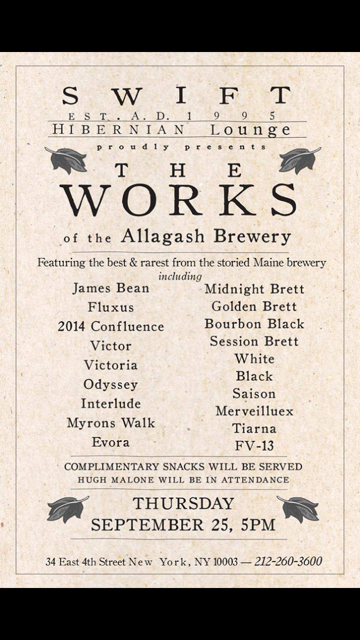 19 Allagash beers, starting at 5pm 9/25/14. And free snacks! “Rare brews from Down East! On Thursday, September 25, at 5pm, our colleagues from Maine’s famed Allagash Brewery will set out their shingle at Swift, offering a cornucopia of their finest and most sought-after beers for your delectation. September 24, 2014 in Bars, Breweries, Events. ← Gotham Goes Sour with Almanac Beer!